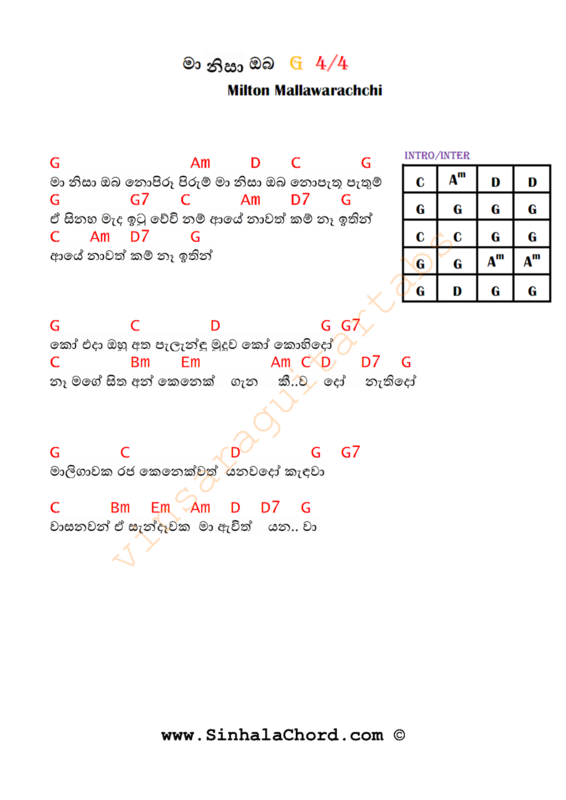 Here is another beautiful sinhala song requested by many users.I'm preparing a tab for the lead guitar part.You will find it in guitar tab section near future. You may leave 7th chords if you are loosing the rhythm when you are strumming. Mallawarachchi completed his early education at Ananda Sastralaya Kotte. He was a member of a short lived group called the Sakyans and subsequently the La Ceylonians. Mallawarachchi's vocals on the latter group's "Daha Duke Vidyahala" and "Mal Ravamal" led to his discovery by producer Patrick Corea. Kurera offered to record the young vocalist on four songs "Oruwaka Pawena," "Ran Kuduwak Oba Sadu," "Sansare Sewanale" and "Mangale Neth Mangale." The songs were released on the Exvee label as a 78 rpm record in 1969 and gave Mallawarachchi his first popular hit with "Oruwaka Pawena." In 1974 renown musician Clarence Wijewardena composed the songs "Gana Andure," "Eda Rae," "Mata Men Ohutada" and "Maga Thotadhii" for a Mallawarachchi EP release on Gemstone. Wijewardena would also write "Awasara Natha Mata," "Sulange Pawe," "Thaniwi Sitinai," and "Pem Raja Dahane" for Milton. One of Mallawarachchi's most successful songs was "Me Mai Gaha Yata" done under the production of Melroy Dharmaratne in 1976. It was released on the Silverline label as an EP backed with "Ran Mudu" and two songs ("Andanne Epa" and "Ma Samanalayak") by Shiromie Fernando. Mallawarachchi released one of the first music audio cassette's in Sri Lanka under the guidance of Wijewardene in 1978. It was titled Anytime-Anywhere and was on the Tharanga label. Mallawarachchi debuted as a playback singer in the 1971 film, Poojithayo. In 1984, he was honored with a best playback singer award at the Sarasawiya Awards for "Kendan Yannam," a song from Sena Samarasinghe's Aethin Aethat. Mallawarchchi was a popular live attraction; at a time when there was no TV in Sri Lanka, his appearances at variety shows sponsored by the Ceylon Tobacco Company drew huge crowds. Mallawarachchi appeared alongside the Super Golden Chimes at the Super Concert 101/102 organized by Wijewardene. He died on March 10, 1998. Mallawarachchi was married to Swarna Mallawarchchi, and had four children: Ranil, Harshini, Nadija, and Tharaka.Ranil Mallawarachchi, the eldest, continues in his father's tradition. 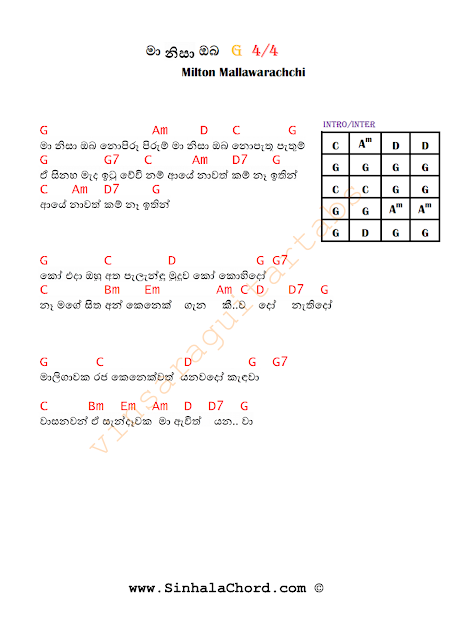 "Etha epita dura akase...swarnwarna tharuwak wilase" song written by Karunarathne Abeysekara for Milton dedicated to his wife Swarna.